Finally it has arrived, the 61′ 6″ full brake from Hornby, in both LNER teak and BR Maroon. I had hoped that this would be available for Christmas, and was quite disappointed when it didn’t arrive under my tree. I bought the teak version last week and my initial conclusion is that the wait was worthwhile. The full brake is a great addition to the LNER coaching stock list, and sits nicely alongside existing first, third, brake composite, buffet, and sleeping cars. High standards were set by all these coaches when first introduced, especially the teak versions where attention to achieving an authentic wood effect was second to none. The full brake has pushed these standards even further, and the only thing I have left to criticise is the price. I find it difficult to justify paying nearly as much for a coach as a locomotive. There are several improvements over the previous Gresley coaches I’ve purchased, though I must admit the last buy was some time ago so some features may now be common across the range. The big improvement is the shape of the carriage side. Hornby have improved the profile of the tumblehome and this now looks pretty much spot on for the real thing. Also changed is the roof colour, which is no longer pure white but rather a very light grey, much more in keeping with something that has been out of the workshops for more than 5 minutes. The couplings are sprung loaded so that a smaller gap between carriages can be achieved while allowing some movement to go around reasonably tight curves without buffer lock. 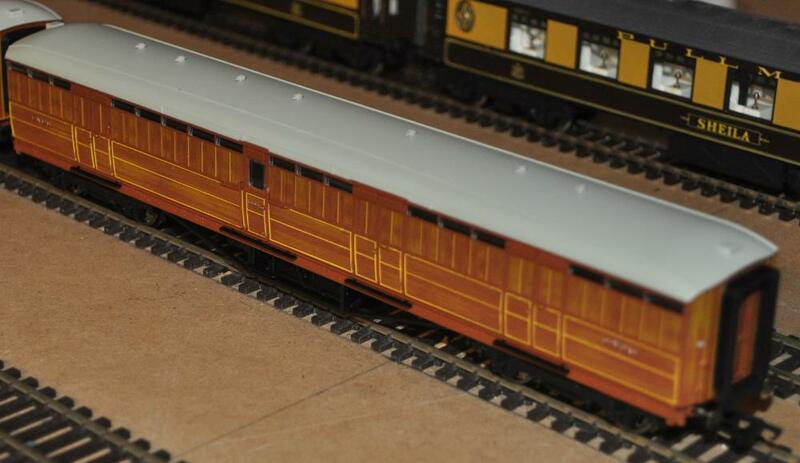 Stocks of these excellent Gresley carriages should be good in most model shops. I sourced mine online from OnTracks, and I can highly recommend their service. In conclusion, well done Hornby, even if the recommended price for a carriage has gone totally over the top at more than 40. I’m not sure how this can be justified in something that has no interior detail at all.